The strongly contested House Bill 4113 on class-size negotiations with teacher unions received a relatively short hearing Wednesday. Another high-profile bill, regarding data breaches, took up most of the time the House Business and Labor Committee had for the day, leaving only about 40 minutes for a hearing on a topic with dozens of attendees signed up to testify. Legislators were unable to ask questions from the dais, and not everyone who signed up was able to testify. This was not well received by committee members, many of whom seemed to be frustrated by the limited time that Chair Paul Holvey (D-Eugene) had scheduled for the bill. Rep. Bill Kennemer (R-Oregon City) gave voice to his frustration and later remonstrated on the House floor against the way the hearing was executed. 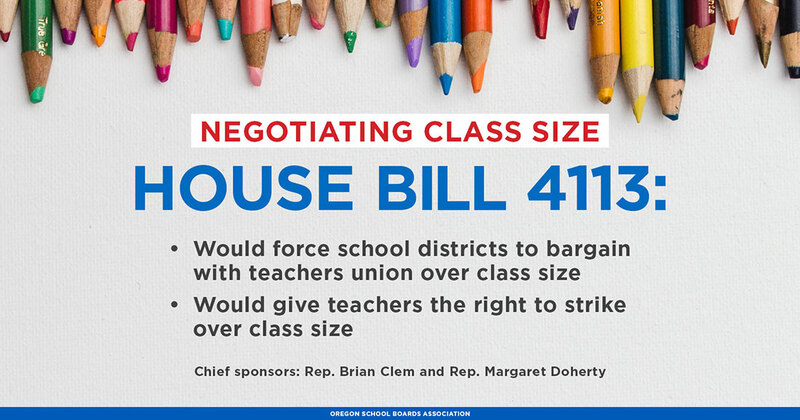 HB 4113 would make class size a mandatory subject of bargaining in negotiations between school districts and teacher unions. OSBA is opposed to HB 4113. A similar bill in 2017 was unable to get out of the House Education Committee. This session the bill was sent to the Business and Labor Committee, where proponents of the measure were expecting a more favorable reception. The future of the bill is unclear. The committee met Friday and carried the bill over to today, Feb. 12. The committee could choose to vote today or could continue to wait. The bill is the priority bill for the Oregon Education Association this session, and it seems likely that there will be a tough, party-line vote in the committee before the Thursday deadline to vote bills out of committee. Proponents and opponents of the measure gave impassioned testimony. Proponents, including teachers and OEA representatives, described the challenges around teaching in classrooms with large class sizes, saying that the bill was about having a discussion. Opponents, including OSBA and the Confederation of Oregon School Administrators, pointed out that discussions are already taking place about class sizes. They testified to the costs associated with making districts bargain over class size and potentially adding teachers or paying teachers more for large classes. Adding teacher salary costs could result in cutting other programs that contribute to delivering a well-rounded education and closing achievement gaps. “Every school board member hears about class size,” said Liz Hartman, Lake Oswego School Board member and member of the OSBA Board of Directors, “but school districts are responsible for all” and student achievement must be prioritized.